Are you familiar with web application frameworks (WAF)? Well, if not, you will be with at least one of them by the end of this page. WAFs essentially support the development of certain web applications. These frameworks often provide useful libraries, databases, and templates to work with. Developers are sometimes encouraged to re-use good bits of code, to save time. Let’s dive in and learn who the best providers are for this criteria. CodeIgniter is a web application framework for PHP Hypertext Preprocessor (PHP) coders. It allows Web developers to advance projects more quickly than they could if writing code from scratch. As open source software, CodeIgniter is affordable, adaptable, and accessible. CodeIgniter is a PHP web development application framework built on the Model-View-Controller (MVC) paradigm. EllisLab released the first public version in 2006. Since 2014, It’s been a community-maintained project of the British Columbia Institute of Technology, available under the MIT open source license. A web application development framework is a tool for creating dynamic websites, web-based applications, and web services. This provides a structure to the overall application, modules or libraries for doing common development tasks. Libraries and modules eliminate the need for a developer to solve a problem that other developers have already solved; Basic functions and features like user login, session management, database access, and form validation. There’s no need to reinvent the wheel, and a good application framework provides these functions so that a developer can focus on the important task of creating new and valuable features. CodeIgniter also provides a structure to a web application, by suggesting a general template for how to organize code and directories. By making some key architectural decisions about how various components interact with each other, structural support is achieved. Having the right structure during the development of an application can greatly reduce future pitfalls. When something is built well, single layers can be amended without the collapse of the entire functioning system. 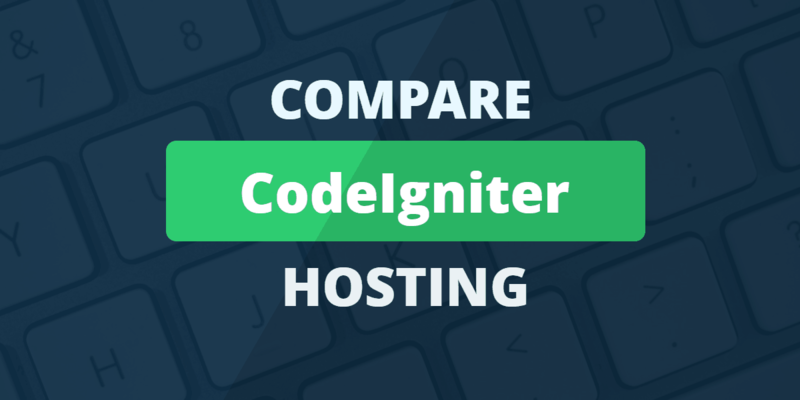 Who's Best for CodeIgniter Hosting? We think SiteGround is the best choice for CodeIgniter. One important thing that CodeIgniter provides is a Model-View-Controller (MVC) outline for application structure. Model-View-Controller is considered by many to be a best practice in application development and is a key feature of the CodeIgniter framework. MVC is, essentially, a way of organizing the components of an application. This is done in a way that separates the underlying data (the Model), the application or business logic (the Controller), and the final presentation to the screen or public API (the View). The easiest way to understand how MVC works is to think about what might happen in CodeIgniter-based web application between a user clicking on a link and that same user seeing the content on the page a moment later. The browser sends a request to the web server, which routes it to a set of scripts called the Controller. The Controller sends a request to the Model scripts, where details about data structure and database access are written. The Model includes code that fetches content from the database and then turns that content back over to the Controller. The Controller then sends that content to the View, which includes HTML template information. The View pushes the rendered page out to the user through the web server. This is a somewhat simplified explanation and omits important details like page caching (which is handled by the View, and which speeds up overall performance). Furthermore, application functionality like processing credit cards (handled indirectly by the Controller), and updating the database (done by the Model). Following this general separation of concerns helps to ensure a high level of code organization. Good decision making about how to implement novel features when building a new web application is also valued. CodeIgniter provides Model, View, and Controller scripts, as well as the libraries and application infrastructure. This allows components to interact in a meaningful way. What are the System Requirements for CodeIgniter? Any operating system that supports PHP should be able to host CodeIgniter. It can run on versions of PHP as old as 5.3.7, but 5.6 or newer is recommended. In other words, CodeIgniter hasn’t got any out-of-this-world requirements. With the appropriate driver corresponding to the selected database, you will have no issues running it. CodeIgniter provides only the scripts needed and nothing else. Most functionality comes in the form a series of plugins and interoperable libraries, so you don’t end up with code for a lot of features you aren’t actually using. Classes for interacting with the database provide a layer of abstraction, freeing you from having to write boilerplate SQL queries, and allowing you to change database software without rewriting your application. Several popular databases are supported, including MySQL, SQLite, and PostgreSQL. The philosophy of CodeIgniter is to make PHP development easier, not harder. To that end, the framework provides a lot of flexibility and does not force you to develop in a certain way. For example, while the MVC model described above is fully supported, the framework still functions in the absence of Models, which is perfect if you are not building a database driven application. CodeIgniter is serious about speed and has made a number of key decision to ensure the fastest possible rendering of pages. One example of this is the automatic caching of rendered pages, which allows frequently-accessed pages to be displayed without the full fetch-and-render process. Another example is the lack of a specialized template language for creating HTML/PHP Views. While a template markup system requires a little less typing and appears a little cleaner in the source code, it is a huge hit in performance because the file essentially has to be rendered twice (once from Template markup into PHP, and then a second time into HTML). In any service or form and data, validation is a time saver. Not only do you ensure the wrong data isn’t submitted, but you don’t waste your time trying to error hunt endlessly. CodeIgniter’s data validator verifies if the data is the correct type, meeting the correct criteria. Whether you’re building a website or an app, it’s important to track a user’s activity where possible. This is a great way of receiving first-hand, honest feedback about the potential structural flaws of your product. CodeIgniter’s session management lets you do just that, by having a simple way of adding, extracting and managing session data. Download CodeIgniter and unzip it. Move the files to your server. Edit the file application/config/config.php to set the base URL. Edit the database settings in application/config/database.php. PHP developers who want to use a framework have many choices. They appeal to different coding styles and development needs. The CodeIgniter PHP framework stands out as a lean framework that produces fast-running applications with low overhead. Building highly complex CodeIgniter projects may be more work than with some other frameworks, though. The application style called REST, where URL paths identify services and parameters rather than file paths are popular in modern web applications. CodeIgniter includes modular helpers that make creating a RESTful service easy. Building and validating forms is another area where CodeIgniter makes life simple. Classes for uploading and validating classes allow the creation of user-friendly forms with minimal effort. There’s no official paid support for CodeIgniter. However, information and help are easy to find. The “CodeIgniter” tag on Stack Overflow. Hosts that support PHP should generally support CodeIgniter. There are occasional issues with environment configuration for certain modules, such as email classes having access to a mail server. Before launching a new project with CodeIgniter, you should make sure the specific modules and features you need are supported by your web host. Additionally, check to make sure that your host supports the version of PHP needed to run CodeIgniter and any required libraries. Like with any service, feature or situation, there are always two ends of the spectrum. Let’s take a look at CodeIgniter’s strengths and weaknesses. Below are my 3 favorite hosts which prioritize CodeIgniter as a framework software. All of these selections are highly sought after brands within the hosting space. A2 Hosting designates CodeIgniter as “featured framework software.” Installation requires Softaculous Premium with cPanel. The servers support PHP through version 7, and customers can select their PHP version through cPanel or by editing .htaccess. Multiple data centers and a 99.9% uptime guarantee mean reliable availability. Support is reachable 24/7 by phone, ticket, and live chat. Siteground is a reliable choice for PHP developers. It offers seven versions of PHP, letting developers test their applications with different versions. There’s no specific support for CodeIgniter, but everything you need to install it is there. SSH access is a standard feature, and the Cloudflare CDN and SSD storage help to make sites fast. Support is active 24/7, and responses are quick. Cloudways is a young web hosting company that caters to PHP developers. It promises one-click setup and fast deployment. It has PHP covered through 7.1, and accounts include SSH, SFTP, SSL certificates, and a free staging environment. The pricing model is complicated but could be attractive to developers on a tight budget, especially since there are no long-term contracts. Support is available 24/7, with phone support costing extra. CodeIgniter is a development framework based on the MVC development pattern. It helps developers build websites in PHP quickly and efficiently. CodeIgniter provides good performance and compatibility, and is easy to set up. It helps novice users code PHP more efficiently. The developers also state that CodeIgniter is much more lightweight than a regular framework. Yes. CodeIgniter is released under the MIT License. CodeIgniter is widely supported on shared hosting accounts. If you prefer to use a VPS or dedicated server, you should be to install it yourself if it does not come pre-configured. How do I install CodeIgniter? Many hosting companies offer CodeIgniter pre-installed. You should be able to install it yourself if you have VPS or dedicated server. Installation includes uploading the files to your server, and then setting the system path, database name, and other variables. Model-View-Controller (MVC) is a pattern that helps developers to create better code. In very simple terms, it treats the data in the application (the model), and the user’s interaction with it (the view and controller), as separate entities. Ideally, the model should contain no code to control the user interface, and the view/ controller should contain no code that controls the data. Will I need to use the command line to use CodeIgniter? No, although command line tools are available. What is the difference between CodeIgniter 3.x and CodeIgniter 2.x? CodeIgniter 3.0 introduced a number of improvements to the sessions, encryption, and database libraries. Version 3 is recommended for improved performance and reliability over version 2. Libraries are small bundles of code that allow you to achieve a common task. For example, CodeIgniter ships with libraries that help you quickly extract data from a database. You can also create your own. Drivers in CodeIgniter are a type of library consisting of at least two classes. They help you to break down code in a logical way using a parent-child relationship model. Does CodeIgniter use a template engine? CodeIgniter comes with a simple template parser, but it is optional. How are URLs created in CodeIgniter? CodeIgniter by creates URLs that are readable to search engines and humans. CodeIgniter segments the URL into the controller class, class function or method, and the ID with any variables. What type of security measures does CodeIgniter provide? CodeIgniter restricts the characters it allows in URLs to minimize the risk of injection. PHP error reporting can be disabled in production, preventing sensitive information from appearing in errors. It includes a filter that detects malicious code, hijack cookies, or other malicious activity. It provides Cross-Site Request Forgery protection, and includes a number of best practices for programmers to improve the security of their code. If you’re looking for an alternative to CodeIgniter, try Laravel or Symfony.